Licensed in California, USA, as a TPA, administers workers compensation and long-term disability claims for self-insured entities and unbundled-claims service for insurance companies and rent-a-captives. professional marine claims specialists covering yacht, hull and marine liability claims. insurance outsourcing. A monthly magazine for property/casualty claims professionals and corporate risk managers. Provides articles on the latest issues affecting the claims industry. Independent claims adjuster handles property, liability, marine, and aircraft claims. Serves the eastern coast of the USA from Delaware to Florida, including the inland states of Pennsylvania, West Virginia, Kentucky, and Tennessee. Offers claims audits and reviews, claims consulting, and claims management. Ontario company services the Americas and Europe. An electronic claims clearinghouse for medical and dental claims transmittals. Provides claims training to individuals and small businesses. Provider of claims law and coverage courses in legal principles, liability, property, and workers compensation. Specializes in insurance subrogation claims. Provides loss consulting for personal and commercial insurance claims, as well as preparing claims and assisting in their settlement. An administrator of workers compensation and short term disability claims, licensed in Michigan and Indiana, USA. Based in southern California, USA, specializing in property claims adjustments and investigations, administration, and policy appraisals. Insurance adjusters and investigators serving the area around Vancouver, British Columbia, Canada. Specializes in casualty claims. Independent insurance adjusters of fire and allied lines claims. Serves Rhode Island, Massachusetts and Connecticut, USA. Independent insurance adjusters and damage appraisers handling multi-line claims in Oklahoma, Kansas, Arkansas, and Missouri, USA. Expert witness offers testimony in benefit claims. Includes information about procedures and claimants rights. West Newfield, Maine. Provides multi-line field claims adjusting, appraisal, third party claims administration, and continuing education services from hundreds of franchised locations throughout the USA and Canada. Independent claims adjusting and investigation with over thirty years experience in multi-line claims handling. Services a large portion of east-central Michigan, USA. Specializes in National Flood Insurance Program (NFIP) losses and all personal line claims. Uses a paperless transfer system called E Cat Claims. Services entire USA. Works with many of the USAs insurers, HMOs, TPAs and reinsurers. It provides services including hospital bill audits, DRG validations, and claims negotiations and repricing for out-of-network claims. If the business hours of Corporate Claims International Ltd (CCI) in may vary on holidays like Valentine’s Day, Washington’s Birthday, St. Patrick’s Day, Easter, Easter eve and Mother’s day. We display standard opening hours and price ranges in our profile site. We recommend to check out corporate-claims.com/ for further information. 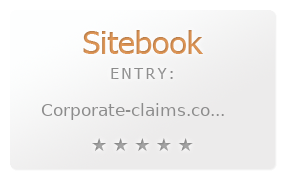 You can also search for Alternatives for corporate-claims.com/ on our Review Site Sitebook.org All trademarks are the property of their respective owners. If we should delete this entry, please send us a short E-Mail.